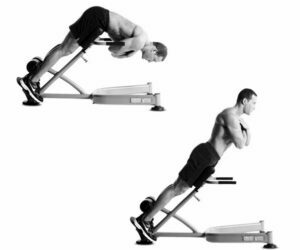 A hyper-extension or back extension is an exercise that works the lower back as well as the mid and upper back, specifically the erector spinae. Hyperextensions mainly target your lower back muscles consisting of the erector spinae which are the large paired muscles (known as “extensor muscles”) in the lower back that hold up the spine. This exercise also targets your hamstrings and glutes as secondary muscle groups. How to do: Position yourself on a Roman Chair facing forward. Cross your arms in front of your chest and slowly lower your upper body down and try to touch your nose to the floor. Once your torso is completely bent over and virtually perpendicular to the floor, slowly return to the starting position and repeat. Be sure that when you return to the starting position that you do not go past parallel and arch your back at the top. For beginners, 2-3 times per week, 2-3 sets of 8-10 repetitions is a good starting point. You can slowly build up to 4-5 sets of 15-20 repetitions. For more experienced lifters, start with 3-4 sets of 20-25 reps. As you grow stronger, or if this is too easy for you, you can grasp a weight plate in your arms for extra resistance.